Official Expedition 44 crew portrait. 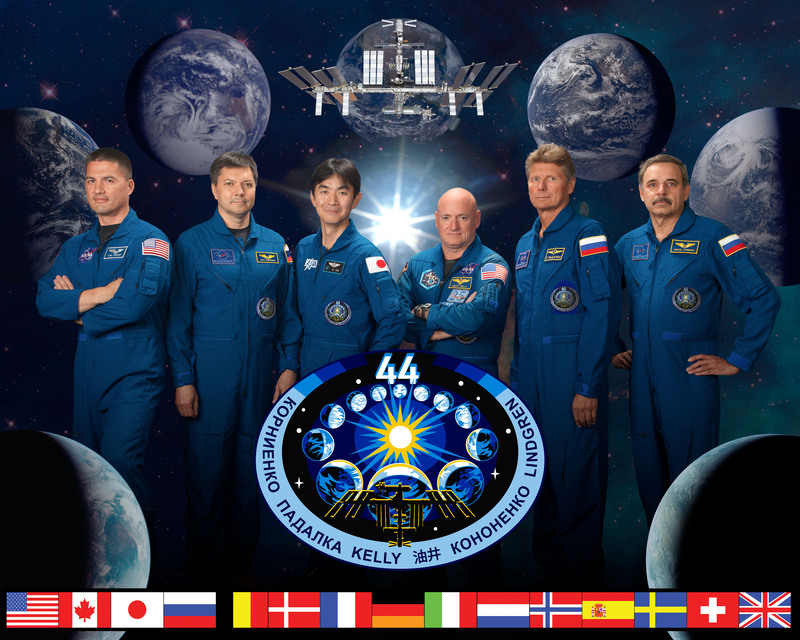 Soyuz 42 (Gennady Padalka, Mikhail Kornienko, Scott Kelly) and Soyuz 43 (Oleg Kononenko, Kimiya Yui and Kjell Lindgren). Excitement is building at Hennepin County Medical Center (HCMC) as they count down the days to NASA’s Expedition 44/45 launch on Wednesday, July 22. The Soyuz spacecraft will carry a crew to the International Space Station that includes astronaut Kjell Lindgren, MD who completed his medical residency in HCMC’s Emergency Department where he was also Chief Resident. Dr. Lindgren (far left) and crew. Dr. Lindgren will serve as flight engineer for this mission, which was originally scheduled to launch on May 25, but was delayed after an unmanned Russian cargo spacecraft failed to reach the International Space Station (ISS) on April 30. An investigation into the malfunction had to take place before Expedition 44/45’s launch could be rescheduled. Dr. Brunette supervised Dr. Lindgren’s medical training in the Emergency Department, and he was invited by Dr. Lindgren to be his guest in Kazakhstan to watch the launch from the Cosmodrome. “I feel so honored that Kjell asked me to be there. Of course it’s a once in a lifetime opportunity for me, but to see my former resident – whom I now consider a friend and colleague – fulfill his dreams of being an astronaut, it’s just so exciting,” said Dr. Brunette, who leaves for Kazakhstan on July 16. This entry was posted in HCMC News and tagged @hennepinmedical, cosmodrome, Douglas Brunette, Expedition 44/45, HCMCMEDED, international space station, johnson space center, kazakhstan, Kjell Lindgren, NASA, scott kelly, Soyuz. Bookmark the permalink.